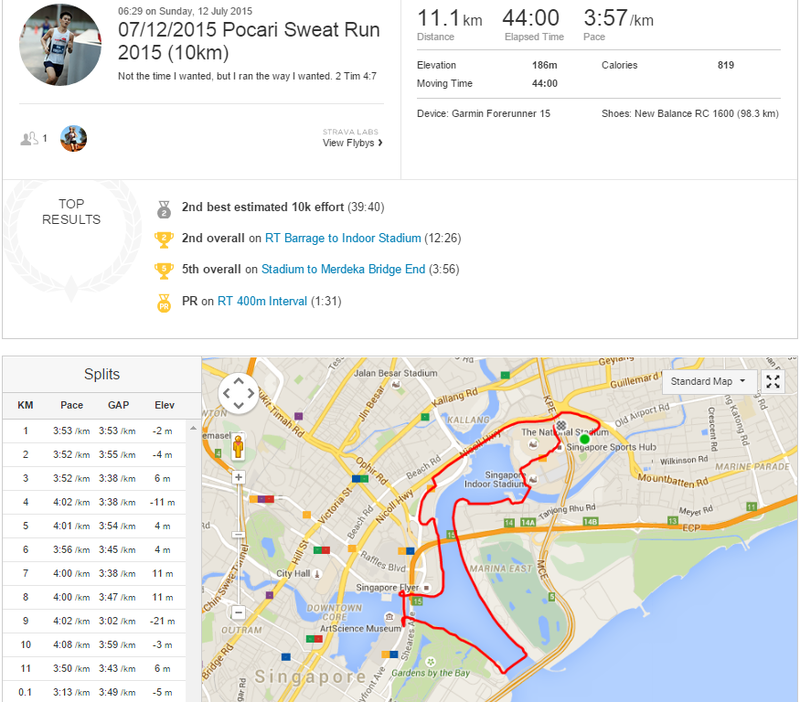 Race Review: Pocari Sweat 2015 [10km] (by Moses) | JustRunLah! If you’ve chanced upon my first race review last week of the OSIM Sundown Marathon 2015 (10km), you’ll probably have come across my personal blog as well. Once again, I shall attempt to provide an objective recount of my race experience. Do look out for the font in italics as they may be notable points (at least to me). I enjoy the convenience of Velocity, one of the extensions of Novena Square. My most dreaded Race Entry Pack Collection location is arguably Singapore Expo as I stay nowhere near it. 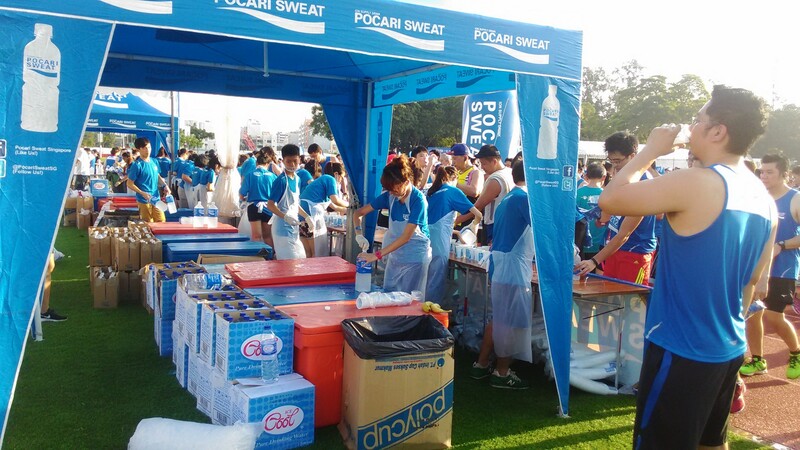 Thankfully, REPC for the Pocari Sweat Run 2015 was to be held at the former location from 4-5 July 2015. Or rather, though it was stated to be held at Velocity, it was held at Novena Square. No complaints from me though, it’s just a minute’s walk apart. I arrived slightly past noon on the 4th. There was a pretty long queue that extended out of the mall, towards Novena Square 2. Thankfully, the volunteers were probably pretty efficient in organising the queue and enabling swift collection of race packs. I spent about 15mins moving through the queue (115m long I’m guessing, with about 6m of elevation). I expected to be running 10km, having registered for the 10km category. It was to be my goal race for the first half of 2015, since my running would subsequently be interrupted by a series of events. Furthermore, having started the build up since the start of 2015, it was probably time to get some time off. Little did I expect that the race would be some distance longer. This piece of information was first made known to runners about a week prior to the race, when the race route was finally uploaded, with a little reminder note that “Actual distance is approximately 11KM”. Was dropped off at about 5.40am, where the roads were still fairly clear. It was probably because the shuttle services only ended up arriving closer to 6.00am (or so I heard). No complaints with that, as I managed to quickly access the baggage deposit. As with most excited volunteers at the start of an event, the empty lanes prompted competition and they were all trying to compete to get me to deposit my bag at their section. Thereafter, I headed to an actual restroom (compared to other races) before proceeding with my warm-up. 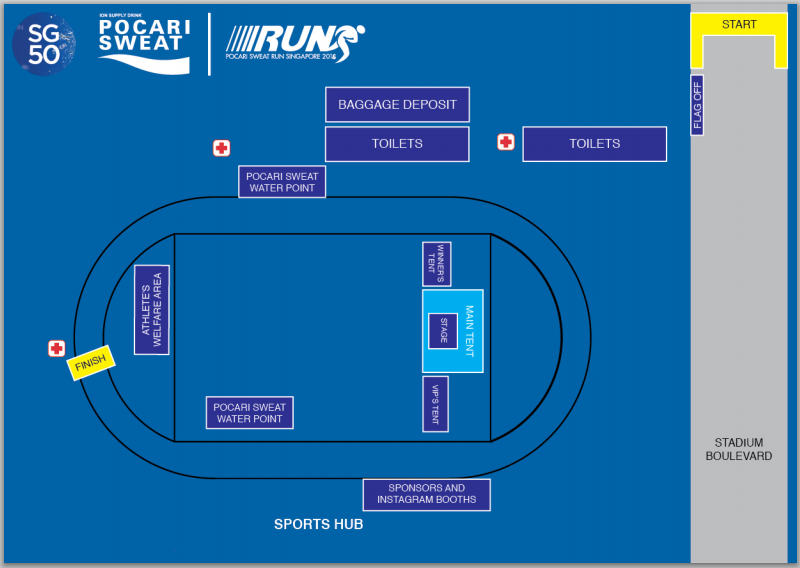 Credit to Pocari Sweat Run’s Race Guide. As I was early and I wanted to run a faster race this time, having encountered considerable obstruction in last week’s Sundown where I started in wave 5, I didn’t hesitate in making my way towards the front when the start pen opened at about 6.00am. I found myself heading all the way to the front as only a handful of runners seemed keen to do so. With lots of time prior to flag off, I sat down for some moments to pray for awhile. With about 20 mins to go, I then stood up to get the blood flowing. Looking around, I observed that the route wasn’t particularly wide, though being at the front, I wasn’t too worried about congestion. Until the pacers arrived with their balloons from the front, congregating at the start. In addition, the Yellow Fellows entered with some speedy doctors (Dr Derek Li, Dr Foo Gen Lin, Dr Lim Bao Ying). Thankfully, the pacers positioned themselves to the left. Unfortunately, I was also positioned to the left as I didn’t foresee this inclusion previously. 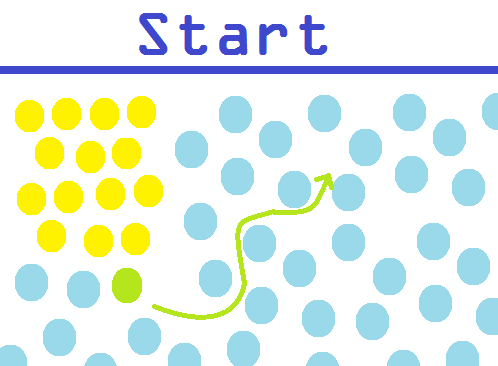 I surrendered my spot and started weaving my way towards the right. Yep I’m in green. The pacers are in yellow and my fellow participants in blue. We were then flagged off at 6.29am. It was a fast start for most of us, though for me, I settled quickly into race pace. The race route took us across Nicoll Highway, past the FI pits, over Bayfront Bridge and then along Gardens By The Bay. Thereafter, we’d head towards Tanjong Rhu and past the Tanjong Rhu Footbridge before finally heading past our National Stadium into the Kallang Practice Track. Oh yes, such a route was obviously more than 10km. In retrospect, different sources of measurements recorded distances ranging from about 11km to 12km. I personally felt the route was close to 11.2km. The notable challenges of the route would probably be the bridges, due to their ascents and descents. In my opinion, Bayfront Bridge was the most damaging because any pace acquired from the steeper descent would be hampered by the hairpin turn at the bottom. Furthermore, there were a couple of steps (it would have been much safer had a temporary ramp been fitted, as some races do) to negotiate. Apart from the bridges, the route did have quite a number of turns. The first 8km is pretty wide. However, as it heads along Tanjong Rhu, the footpath becomes considerably more narrow and expectedly, the inevitable congestion did frustrate some runners. Hydration stations were situated around the 3km, 5km, 7km and 9km marks (not to mention the endless supply at the finish), hence I’m sure no one would have had any complaints about them. Races often provide isotonic hydration along the route, though it isn’t necessarily provided at every hydration point. Even if a station has isotonic hydration, one has to pay careful attention to identify the isotonic section of the hydration point. Here’s my Microsoft Paint illustration. 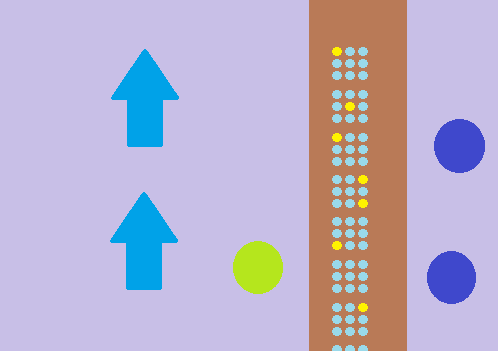 The sneaky yellow cups (isotonic) try to remain inconspicuous in the blue sea (water) as the runner (green) runs along the hydration point. 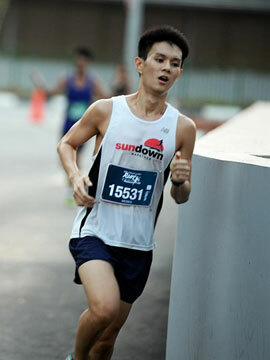 Here I am around the 10km mark, certainly looking more comfortable than how I felt. Credit to Running Shots. Oh before I forget, distance markers were present throughout, indicating the distances quite accurately (though the disparity between the distance markers and when my Garmin FR15 auto-lapped grew as the race went on). This meant that for this ’10km’ category, we actually passed a 10km distance marker (you probably wouldn’t find a 10km marker in any other 10km race – instead you should find relief), only to continue running as we headed towards the finish line. I was dazed and dizzy after finishing. I honestly don’t remember too much, other than having some brief conversations with some of the other finishers. We were provided with a banana, a bottle of Pocari and collected our Finisher’s Medal and Finisher’s Tee as well, all collected without any difficulty. The medal was a solid but simple golden medal manufactured by ELM. Thereafter, in my dazed and dizzy state, I probably rested for some time before moving around again and catching some friends. Some of my little consolations, despite missing my goal (assuming my GPS is accurate), had to be what followed after the race. The endless hydration after crossing the Finish. Refreshing. Well thank you for reading 😀 Once again as I stressed in my previous review, the context of my experience is paramount in evaluating the race. Runners completing in a faster or slower time would probably face a different set of challenges so do bear that in mind 🙂 If you’d like, you may check out my personal review of this race here. 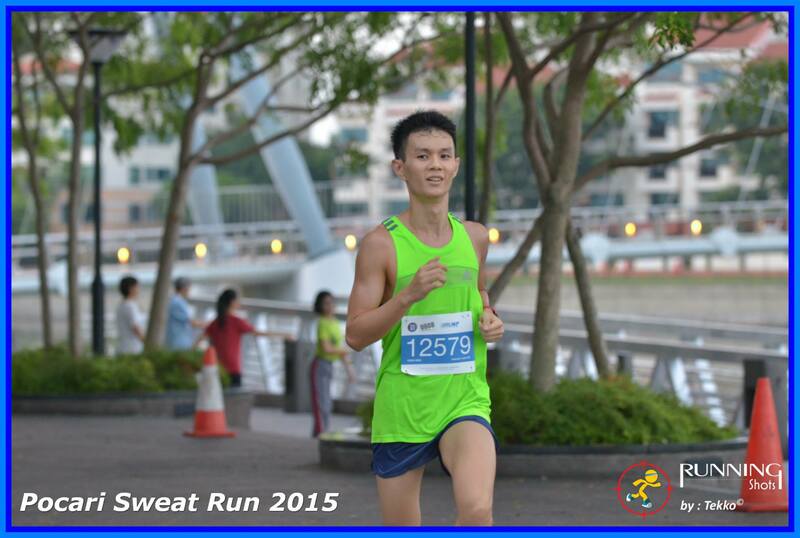 Cover photo credit: Pocari Sweat Singapore. Poor communication between the bus driver & the organising committee. Bus driver don’t even know what time to go, whr to drop us and most importantly which road is closed for the race. This has result me rushing to the start line. 2. Sign board to baggage deposit is poor. 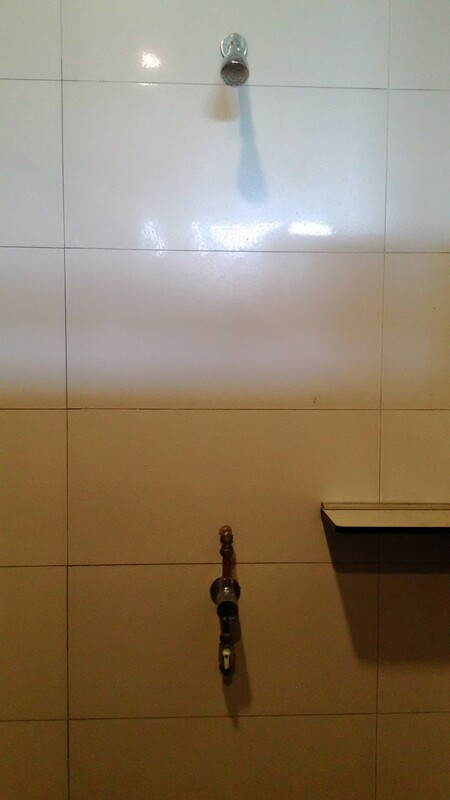 No sign board. 3. Collection of medals & finisher t-shirt is also poor. Hi Michael, I’m sorry to hear about your unpleasant experience with the bus service, baggage deposit and collection of finisher’s entitlements. Hope the other aspects of the race such as the adequate hydration were positive! I’m not in any way affiliated to the organisers. However, you’ll probably have received a feedback survey in your email and perhaps you could share your experience with the organisers.